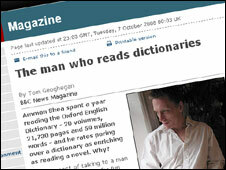 Lots of sesquipedalians out there, judging by the response to our feature on the man who reads dictionaries for fun, Ammon Shea. We asked for your favourite words and were overwhelmed with nominations. Here we list 50 of the best. 1. To throw something (someone) out of a window is to defenestrate. I love this word because it immediately brings some interesting memories to the front, not to mention makes me think of some new things to toss out of a window. 2. Poodle-faker - a young man too much given to taking tea with ladies. 3. Omphaloskepsis (self-absorbed, navel-gazing). I'm not really a selfish person, but I do occasionally need someone to remind me to look up from my navel. Plus, things that have to do with belly-buttons are generally pretty fun. 4. Mallemaroking - the carousing of seamen in icebound ships. A wonderfully useful word! How many icebound ships do we all know? 5. Spanghew - to cause (esp. a toad or frog) to fly into the air off the end of a stick. (In northern and Scottish use.) Why? Well, all one has to do is imagine the myriad situations in which one might use this word. 6. Scrimshanker - one who accepts neither responsibility nor work. 7. Zareba - a protective hedge around a village or camp, particularly in the Sudan. Used to great effect by PG Wodehouse in, for example, The Clicking Of Cuthbert, with his description of a Russian novelist: "Vladimir Brusiloff had permitted his face to become almost entirely concealed behind a dense zareba of hair." 8. I first heard Stephen Fry (of course!) use this on QI. Tmesis - To break one word with another. For example: dis-bloomin-graceful, un-flippin-believable. Use it mainly when talking to British Gas. 9. I love the word quidnunc, which means one who gossips because it is a word I could use to describe a lot of people who fit the definition and they wouldn't know what I was saying. 10. Ischial callosities is a great description, because of its precision. It refers to the leather-like pads on a monkey's bum. 11. One of my favourite words is cryptomnesia because it captures the meaning of a whole process that I previously never thought could make it into a single meaningful word. Of course it makes sense, and literally means "buried memory". I first came across it reading Jung when he described the process of forgetting the source of some information and assuming you've known it all along. That's such an ephemeral process, and I'm fascinated by it as much as the word used to describe it. 12. One of my favourite words is urt. Urt is almost onomatopoeic, since an urt is a "leftover bit". 13. I like the word termagant meaning a quarrelsome shrew of a woman - because it's just obscure enough to get mixed up with "ptarmigan", a lovely bird. 14. Oxter- space under the arm (not the armpit) eg he walked down the street with a copy of the Times under his oxter. 15. Spelunking- the hobby or practice of exploring caves. The word just sounds good, I love it! 16. Petrichor - the sweet smell of rain on dry earth. Although I wouldn't consider myself enough of a lexiphane (another good word, meaning "one who uses words pretentiously") to bring it up in every day conversation. Plus, living in Scotland, dry earth isn't a phenomenon I'm used to. 17. Frippet (noun) - A flighty young woman prone to showing off. Could be used for the vast majority of contestants on Big Brother. 18. Panglossian - Excessively or naively optimistic. The world needs more people like this now than ever! 19. I love the word proprioception (go ahead and look it up - I define it as knowing where you are in the world, where your body stops and everything else begins). I learned it in an undergraduate psychology course, probably. One of my favourite things about this word is that I can never remember it! I'll come across a use for it and then rack my brain for several minutes before having to give up and then of course suddenly remembering it (there's another word I have the same experience with but I can't remember what it is just now). There's a French term that I believe is tangentially relevant to proprioception - "jusqu'au bout". It means "to the end" but it was explained to me (by a nice young French man, many years ago!) in the context of "je t'aime jusqu'au bout", as in to love someone all the way to the ends of their fingers and tips of their ears (etc!). 20. If you ever fly into the US, then one of the questions you're asked on the entry form you have to fill in is "Have you ever been convicted of moral turpitude?" What a great word turpitude is! I've never heard it anywhere else, but I can guess what it means and that the required answer is "NO". Just the sound of it is faintly dubious, once you've realised that it's not something you use to clean your paint brushes with. 21. I like the word discombobulated. It has a staccato, mechanical sound and conjures up an image of a robot scrabbling to hold itself together when all its nuts and bolts suddenly start to fall out. Which is just how one feels when discombobulated! 22. Floccinaucinihilipilification - this word was used by Bollywood star Amitabh Bachhan 20 years ago while giving an interview. I was struck by his choice of word and the meaning of it! 23. Pusillanimous (lacking in courage or strength of purpose) just sounds funny and derisive and insulting. 24. Sepulchral - of or pertaining to the tomb. I just love the way it sounds and the movements my mouth must make to say it. To be sure, I rarely have the opportunity to use it, except during Halloween. 25. I love the word sphygmomanometer, which is the medical instrument used to measure blood pressure. Try saying it after a drink or two. 26. Crepuscular, which means "of or like twilight". 27. Sinecure - a position or office that requires little or no work but provides a salary. 28. Word: kakistocracy. Definition: The government of a state by the worst citizens. A very useful word! 29. Chthonic: first encountered in Philip Pullman, then in the BBC series Rome, meaning dead, underground, of the nether world. 30. Runcible as used in Edward Lear's poem The Owl and the Pussycat - given in Chambers Dictionary as meaning a pickle-fork but used in our household as anything, especially cutlery, which is slightly ill-matched or bent/crooked. 31. I very much enjoy palimpsest because you would never think that there was a word for something so specific as that: "A parchment or other writing surface on which the original text has been effaced or partially erased, and then overwritten by another." Its etymology is beautifully direct. From Ancient Greek "palin" meaning "again" (as in palindrome) and "psen" which means "to rub smooth". 32. I like susurrus which means a soft murmuring or rustling sound. Terry Pratchett used it to great effect in one of his books, and I couldn't help hearing the sound of a gentle breeze on tree leaves whenever I read it. Almost like magic. 33. I just like the sound of the word tintinnabulation and if you look it up in the OED, it simply describes a sound made by the ringing of a bell. Imagine using such a word in everyday language. 34. Maieutic is one of my favourite obscure words. It means pertaining to intellectual midwifery and describes as no other word does a phenomenon that happens more often than you might think. It is very rewarding when you can match the moment to the word. 35. Crenellate - to furnish a wall with crenels or battlements, the rectangular "gaps" seen atop castle towers. For me, this word conjures up images of seaside holidays and carefully constructed sandcastles. 36. Borborygmus - the rumbling sound that comes from an empty stomach. 37. Fug. I love jazz and have always thought a cellar jazz bar with a hazy atmosphere created through captivating music and hazy smoke would be perfect if called "The Fug". However, the smoking ban now prohibits any kind of fug. And "The Sanitary" just doesn't have the right ring. 38. Metanoia - the act or process of changing one's mind or way of life - is so beautiful. 39. Estivate (the opposite of hibernate), because that is what I do. With the onset of autumn, I am looking forward to awakening from my summer torpor. The colder the day, the happier and more energized I am. 40. Rodomontade is my favourite, meaning boastful. Difficult to use in conversation though! 41. Slubberdegullion is a favourite word of mine, meaning, roughly ,a worthless person. Throw it in next time you're gossiping about someone. 43. Chatoyant is a word I learned from a poet/artist friend, and I teach it, or use it, whenever possible, which is quite often. It means something that glows from deep within, like a cat's eye (chat), or star sapphires, or highly polished hard woods. 44. I like enervating (to weaken physically) because it sounds like it SHOULD mean the opposite to what it DOES mean. 46. Mellifluous - sweet, pleasant-sounding speech, words or music - is a my favourite word, though I suppose it couldn't really be classed as obscure. It's so beautifully onomatopoeic. 47. A word I recently learned and immediately liked, is ideation. It's like you take a creative word and turn it into a verb, make it creatING! Ideation means "the process of thought" or "the conceptualization of a mental image". 48. I used to love the word syzygy because, in the Oxford Illustrated Dictionary, its definition (in the mathematical sense) went something like: "A group of rational, integral functions, which, when severally multiplied together, the sum of the products vanishes identically." 49. My favourite word is sesquipedalian. From the Latin, sesquipedalis, meaning a foot-and-a-half, it means given to using long words. 50. I'm disposed to immediately feel dyspathy with a secretary like Shea, but after goving at his story for a while, I begin to hansardize. There's no point in being philodoxical just because an apparently mundane subject deeply happifies another. I may stroke my natiform chin sceptically at Shea's cachinnations, but if such things truly make him tripudiate, then who am I to be the pejorist?